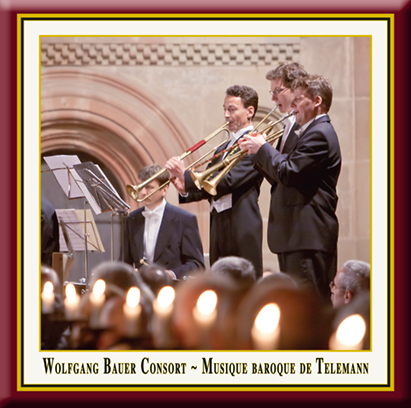 he primary occupation of the Wolfgang Bauer Consort is the performance of authentic Baroque chamber music pieces. The English Baroque term "Consort" accurately describes an ensemble comprising one or two soloists and a continuo of cello and harpsichord. The Consort's open structure provides the fundament for the comprehensive array and musical diversity of this performance in the monastery church, whose outstanding acoustics and atmosphere are able to document the complete range of Baroque virtuosity. Wolfgang Bauer studied in Berlin with Konradin Groth at the Berlin Philharmonic's Orchesterakademie. At the age of 21 he was taken on by the RSO Franfurt while still a student as principal solo trumpeter. He stayed with that orchestra for 12 years and was also solo trumpeter with the symphony orchestra of Bavarian Radio. He has attended intensive study courses with Lutz Köhler and Ed. H. Tarr. His breakthrough as a soloist came in 1993, when Wolfgang Bauer won the German Music Competition and the ARD International Music Competition in Munich in quick succession. Since then, he has been acknowledged as one of the leading trumpeters of his generation and has appeared as a soloist with famous orchestras like the Royal Philharmonic Orchestra London, the Orchestre National de France, the SO of Bavarian Radio, the radio symphony orchestras of Stuttgart and Frankfurt, the WDR Symphony Orchestra Cologne, the Radio Philharmonic of Hanover, the London Philharmonic Orchestra, the Polish Chamber Philharminic, and the Württemberg and Stuttgart Chamber Orchestra under conductors like Lorin Maazel, Carl St Clair, Donald Runnicles, Dimitri Kitayenko, Andrey Boreyko, Denis R. Davis and Eliahu Inbal. In 2000 Wolfgang Bauer was appointed a professor of trumpet at the "University of music and performing arts" in Stuttgart. In 2009 he was honoured with the ECHO Klassik as "best instrumental soloist of the year". Since its foundation in 1994 the "Wolfgang Bauer Consort" was invited to festivals like the "Rheingau Music Festival", the "Schleswig-Holstein Music Festival" and the "Summer Festival" in Bad Kissingen. Beside tv- and radio-productions for "Hessischer Rundfunk" (Hessian Broadcasting) and "Norddeutscher Rundfunk" (North German Broadcasting) the Consort released a honoured CD for children in 2005 and another live-recording from Maulbronn Abbey, which includes the 2nd Brandenburg Concerto by J.S. Bach et al. This concert was performed by Dietlind Mayer, Violin at "il capriccio" for example, Ludwig Hampe, sought specialist on the viola d'amore and soloist in the "Frankfurt Opera Orchestra", and Petra Müllejans, one of the leading baroque violinists in Europe. She is professor at the Academy of Music in Frankfurt and concert master, musical director, soloist and chamber musician of the "Freiburg Baroque Orchestra". One focus of her musical work is chamber music from the 17th and 18th century, which she performs with the "Freiburg Baroque Consort" and the Ensemble "The Age of Passions". The woodwind group was Georg Siebert (oboe), Ingo Goritzki (oboe) - professor at the Academy of Music in Stuttgart - and Arie Hordijk on bassoon. The Trumpet section consisted of Wolfgang Bauer, Tobias Ziegler and Martin Maier (Stuttgart State Opera), supported on timpani by Gregor Daszko. The basso continuo (figured bass) with Thomas Strauss on harpsichord and Clemens Weigel on cello form the basis of the Consort. Both are renowned baroque specialists. Thomas Strauss is cantor in Oppenau, Clemens Weigel is cellist on "Gärtnerplatztheater" Munich. The double bass is performed by Davide Vittone. for trumpet, 2 violins & B.C. from: Tafelmusik for Violin & B.C. for trumpet, 2 oboes, bassoon & B.C. Sonata "Sabato" & Sonata "Domenica"
for 3 trumpets, timpani, 2 oboes, strings & B.C. This fine disc is yet another in the stunning series of CDs produced by the enterprising Josef-Stefan Kindler and Andreas Otto Grimminger and recorded in the sublime acoustic of the UNESCO World Heritage site of the Maulbronn monastery near Heilbronn in Germany. 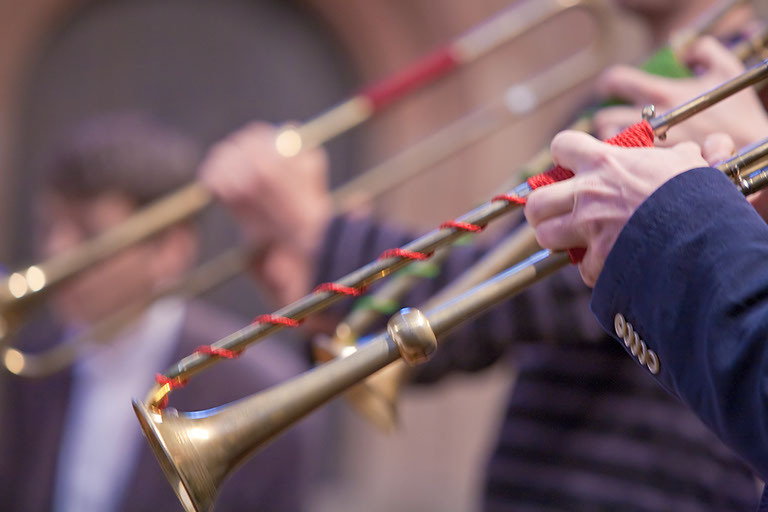 Telemann has become quite well served on record of late but this eclectically mixed concert is a joy just to sit back and relax with the sounds of trumpet, string instruments and clarinets competing for attention. I have recently had the opportunity to listen to several CDs from the Concentus Musicus Wien in numerous Telemann works but the striking ambience of this particular recording was truly eye-opening. Each soloist led by the able virtuoso Wolfgang Bauer brings the works to life in an uncanny sense of historically informed music making. This is a joyful disc which deserves the widest possible currency.